[A]: When another ::Gold Paladin:: Rides on this, you may call this to (R). 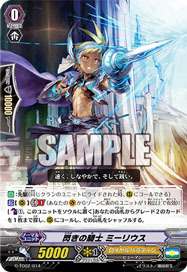 [S] [(R)]: [Counterblast: (1), Put this in Soul] Look at up to 5 cards from top of your Library and search for up to 1 Grade 3 or higher ::Gold Paladin::, reveal it, and put it in your hand. Shuffle your Library. Concentrating my overflowing emotions, I now clench my fist.